Home Page > Feature Articles > Can sensor tech turn Christchurch into the smart city of the future? It’s been hyped as the classic phoenix-from-the-ashes story – the idea that the Christchurch rebuild could produce a better, ‘smarter’ city than before, and one that could serve as a template to other transformation-inclined metropoles. But, in a sense, we’ve been here before. In 2013 the ‘Sensing City’ project was launched, then called ‘a world-leading project to transform Christchurch into a smart city of the future’. Proposed was a network of sensors that would monitor pedestrian and traffic flows as well as air and water pollution levels, among other things, but two years later the project was scuttled due to financial pressures. So just what has become of Christchurch’s sensor-city ambitions? Well there’s still life in the idea. Under the radar Christchurch is still undergoing something of its sensor-based smart-city transformation, albeit in a slightly more muted fashion. Presiding over much of the (quiet) creative chaos is Smart Cities Christchurch, a Christchurch City Council initiative, designed use technology and data to ‘bring communities, innovation, and information together’. One of the key ambitions of the group is the rollout of a network of sensors across the city – similar to that proposed during the Sensing City project – providing multiple ‘smart’ features, including better earthquake data, better parking and even tidier rubbish bins – developments which just may see Christchurch still emerge as a groundbreaker in smart city technology. One of the focuses is, of course, earthquake monitoring. The Council has partnered with Canterbury Seismic Instruments to develop infrastructure sensors. The first of these were deployed in October, with an ultimate goal of 150 around the city, which would make it the largest mass deployment of such instrumentation in the country’s history. Positioned at 100-200m intervals (the majority of which are installed in traffic signal boxes with the remaining sensors located at Council facilities and other important sites), the sensors measure earthquake ground shaking across the city, providing real-time information for Civil Defence and building owners. This data collected by these devices will be used by engineers, research organisations and authorities to understand the key weaknesses, and the resilience, of the earthquake-prone area. 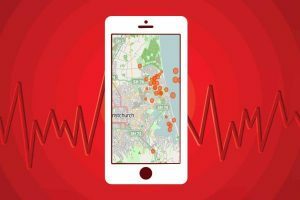 Similarly, local tech company Sense3 has been enlisted to develop the Earthquake Response Visualiser, which uses ground acceleration data collected from sensors around the city to display key data points around the force and impact of Canterbury earthquakes. In the event of another major shake this information will allow engineers to quickly determine the appropriate responses and focuses of inspection. In turn, it’s hoped that targeted prioritisation and rapid decision making will cut building closure periods and reduce the negative consequences for the city. It’s clever tech and if all goes well, the Council says there’s no reason why Christchurch couldn’t become a world leader in earthquake management. “We have more information than ever before, but it is still not enough,” says Smart Cities Programme manager Teresa McCallum. There’s more to sensor tech than preserving life and limb however. In August rubbish bin sensors were rolled out in litter-prone sites showing there is still will – and a budget – to bring IoT to the Christchurch redesign. The sensors attach to the inside of bin lids and use audio waves to detect how much rubbish the bins contain. Updates can be sent to contractors to let them know when the bins are ready to be cleared. With GPS location and tilt, shock, vibration and temperature sensing, the sensors aim to reduce the incidence of overflowing bins, reduce CO2 emissions and pollution due to unnecessarily frequent collections and help the Council identify patterns in bin usage. (Sudden spikes in rubbish levels at night for example could indicate that household rubbish is being dumped illegally.) Following a two month pilot project the Council is working with local contractor Citycare and local manufacturer PiP IoT to deploy a further 100 bin sensors across Christchurch. McCallum says the project shows how IoT technology can be used to utilise resources where they’re needed the most. And there’s plenty more IoT potential to go around. Sensor technology is currently being trialled in a pest eradication initiative on the Port Hills and there’s even talk of cutting-edge robotic buses circling the central city within the few years, with tests currently underway at Christchurch Airport. But all of this seems to beg the question: Given we’re paying good money to generate all this data, how can we be sure it’s being leveraged to its fullest extent? Luckily, initiatives to bring new functionality to already collected data are underway too. The CCC’s SmartView project is one example. Pulling together data from multiple public sensors around the city, as well as information from the private sector, SmartView offers real-time information for locals and visitors on a number of topics, all in real time via an easy-to-access app-like website. “As we increase the number of datasets, we aim to create a web app that will become essential for Christchurch residents and visitors alike,” says McCallum. “We have identified early on that there are several places you can go to find data about Christchurch, but those sites can sometimes be hard to find and difficult to understand. While the Sensing City project may have failed – perhaps a case of too much ambition too soon after the tragedy of the 2010 and 2011 earthquakes – there’s still good work being done, as evidenced by the successes of several Smart City projects in IDC’s 2016 Smart City Asia Pacific Awards. And with the Council pledging $6 million over the next four years to continue the support smart tech development, including more sensor technology, it’s reasonable to hope that Christchurch could still emerge as the country’s testing ground – and perhaps even a global leader – in smart city thinking.